by Christel Kraft, M. Ed. My evolving story with Focusing: How I live it. How I teach it. 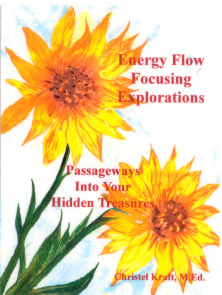 How it guides my students and clients towards their Hidden Treasures. Topics include: A Deeper Spiritual Connection; Embracing All Our Parts/Aspects: The Shadow, Inner Child, The Critic; Focusing Exercises and Examples about Basic Needs and Irrational Ideas; Symbols and Dreams as Passageways; Application of Focusing to Career Counselling; Interactional Focusing for Conflict Resolution; Resources for EFT. TAT. books, etc. We are offering this book as a free download, but we encourage you to make a donation to the Focusing Institute. 2. Then click here to make donation. 2. If you would like to support Focusing, you can click here to make donation. Thanks!